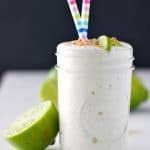 A creamy, zingy and delicious key lime pie smoothie that's a healthy clean eating snack or breakfast to satisfy your sweet tooth. Add first 6 ingredients to blender and combine! Top with graham cracker crumbs and serve immediately. If you want to keep this really healthy, you can even make your own homemade wholewheat graham crackers, which only require one bowl, no mixer, and a handful of pantry staples. Grab the recipe HERE!